Based on personal experience, Ashok Kumar is an expert on international medical education. 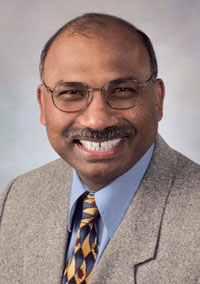 Kumar obtained his medical degree in India, completed his residency in the United Kingdom and now practices and teaches family medicine in San Antonio. In India, Kumar's medical education began at age 18 and lasted 4½ years. It was practically free, and nominal fees were paid by his family. He moved to England for his surgical residency, at St. James's University Hospital and completed a fellowship at the Royal College of Surgeons of Edinburgh in Scotland. He later came to the U.S. and did his family medicine residency at the University of Texas Health Science Center in San Antonio, where he is now professor and vice chair of medical student education. Kumar has seen these three medical education systems—with all their flaws and attributes—up close. And he says that making primary care more attractive to students while not overloading them with debt requires fundamental changes. “I think we have to change our payment system and we have to change our education system,” Kumar says. At a time when medical education debt in the U.S. is at a record high, and a shortage of primary-care physicians is reaching a crisis, it's worth looking at how other nations are preparing the next generation of physicians, and addressing the global shortage of primary-care clinicians. Congress included some workforce provisions in the Patient Protection and Affordable Care Act, and while some say they are a step in the right direction, others say they don't go nearly far enough to begin to tackle these critical issues. Kumar, for one, has high praise for the British system. “We have a lot to learn from England,” he says. “A primary-care-based system is always best,” he says. Primary-care doctors are paid the same or more than specialists in Britain, and most enjoy regular work hours. Pay-for-performance programs are well-funded, and medical education is free, so debt is not a factor in specialty choice (See related story on a new round of reform in the U.K.). 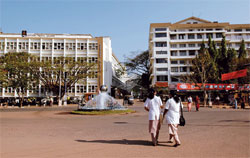 Manipal (India) University, above, operates Kasturba Medical College, a private school. The number of medical schools in India has doubled since 1980. In India, education at the nation's 258 medical schools is free at public schools and costs between $3,000 and $6,000 a year at private schools. The poorest students get full scholarships. But medical education in India has undergone a transformation in recent years, with medical schools doubling since 1980 and an explosion in private medical practices. India is also hampered by a lack of faculty development, according to several recent studies. More people in India are buying private insurance, leading to an increase in private practice medicine. Physicians at academic hospitals are paid a monthly salary, but that option is less attractive today with the growth in the private sector, where specialists can earn more money, Kumar says. In addition, about one-third of physicians leave India each year for residency training or practice abroad, including 1,500 who head to the U.S. annually, according to a 2006 report in the journal Medical Education. The cost of medical education continues to rise in the U.S. For the 2009-10 academic year, median tuition and fees ranged from $26,800 for in-state public schools to $45,800 for out-of-state private schools, according to the Association of American Medical Colleges (See chart, p. 27). Each is up by more than $1,700 from the prior academic year. The average student loan debt for the class of 2009 was $156,500, according to the AAMC. Seventy-nine percent of graduates had debt of at least $100,000, while 58% had debt of at least $150,000, according to the association. Naturally, new physicians want to pay off their debts as quickly as possible. The link between high medical education debt and low entry into primary-care practice—because of the lower compensation—has been well-documented in the U.S. But making medical education free or almost free may not solve the dearth in primary-care physicians. Take Brazil. Although medical education is free at public universities, students have little appetite for family medicine, according to recent reports. The Brazilian government has attempted to foster a culture of primary and community care, by providing universal access to care, starting in 1988, and through the Family Health Program, launched in 1994 to create professional health teams to provide community care. The problem, according to Blasco, is the absence of a robust family medicine component in Brazil's medical education, resulting in a lack of credibility and a “discouraging climate for family medicine.” Students are not inspired to go into family medicine, and it receives far fewer applicants than other specialties. Efforts are now under way to change the perception of family medicine in Brazil through fellowships and mentorships, he writes. Although Brazil attempted to design a health system based on primary and community medicine, it forgot a key component: training the next generation of physicians to value this kind of work, Blasco argues. Nash of the Jefferson School of Population Health says that primary care also suffers from an image problem in America. As in Brazil, in our culture technology is what's attractive. “In academic medical centers, that's what sells,” Nash says. Some European countries also are making fresh efforts to increase their medical workforces in underserved areas. Health workforce planning—or designing and deploying a medical education system to meet the needs of the population—is gaining traction in Europe. Gerard Anderson, director of the Center for Hospital Finance and Management at Johns Hopkins Bloomberg School of Public Health, earlier this month attended a meeting on health workforce planning in Copenhagen, Denmark. Medical education debt is largely unheard of in Europe but there is an issue of getting physicians to continue to practice in rural areas. “They have the same issues we have in this area,” Anderson says. The difference is that the U.S. system is largely free market. The American Academy of Family Physicians has been advocating a holistic approach to address the problems we face here. “You need to look at three components,” says Lori Heim, president of the AAFP. These are: medical school, residency programs and the current workforce. “If you focus on one without addressing the other two, you are bound to fail,” she adds. Step one would be to alleviate the burden of medical education debt for primary-care physicians, through scholarships or loan forgiveness. Step two would be to shift unused residency slots offered in specialties to primary care. And step three would be to increase Medicare, Medicaid and private-pay reimbursements for primary care, and move away from a fee-for-service system toward a medical home and care coordination model, Heim says. The healthcare reform law includes a number of provisions to support these three areas. For instance, the law allocates $1.5 billion over five years to expand the National Health Service Corps, which repays school loans and offers scholarships to primary-care providers working in rural areas. The law also includes tax breaks on student loans for primary-care professionals working in underserved areas, and increased Medicare and Medicaid reimbursement for primary-care physicians. The law includes demonstration projects for bundled payments, medical homes and accountable care organizations. Heim says these provisions are a good first step. Boosting pay for primary-care physicians a little bit won't solve the problem, agrees Uwe Reinhardt, a healthcare economist at Princeton University. “You will have a problem even if you double physician pay because of the differential between compensation for primary-care physicians and specialists,” Reinhardt says. Some medical schools offer debt relief and other aid. At Stanford University in Palo Alto, Calif., where medical school costs $92,000 for this academic year, students can work part time as teaching assistants to offset some of the costs. In some countries, such as Finland, working during medical school is fairly common, but not in the U.S.
“Our approach is kind of unique because our curriculum is flexible enough to do part-time work,” says Martha Trujillo, director of financial aid at the Stanford School of Medicine. Students can choose to extend their academic program up to five years, and the annual tuition drops substantially for those who extend their time in school. The average debt of graduating students at the Stanford School of Medicine in 2009 was about $90,000, about 57% less than the average student's medical debt, according to the AAMC. Still, less than 20% of Stanford grads choose primary care, Trujillo says. Public service loan-forgiveness programs, including the National Health Service Corps and through the Armed Forces, are available but unpopular. Viviana Martinez-Bianchi, who received her medical degree in her home country of Argentina, says the payment system and the way we approach care as a nation needs to change. She is now an assistant professor and associate residency director for the family medicine residency program at Duke University in Durham, N.C. In Argentina, medical education is free, and there is no entrance exam when students enter medical school at age 18. Some schools have no entry requirements beyond completing high school; others require completion of a basic biology or physics course. About 12,000 students are admitted to Argentina's 29 medical schools, but there is a high dropout rate. Some schools have class sizes of more than 2,000 students, according to a December 2006 report in the journal Academic Medicine. After five years of classes, students spend one internship year on a patient-care team, either in primary care, emergency medicine, pediatrics, internal medicine, OB/GYN or surgery. But Argentina has too many doctors, a ratio of 29 physicians to every 10,000 people. The ratio of physicians to nurses in Argentina is 5-to-1 compared with the World Health Organization's standard of 1-to-4. Only half of graduates are admitted to residency programs each year because of intense competition. Martinez-Bianchi left Argentina 20 years ago to pursue a residency program in America. At the time, she saw career barriers in her home country because she is a woman, she says. In the U.S., she found mentors who encouraged her to pursue family medicine as a career path. Kumar of the University of Texas agrees. “Something happens to students between the first and fourth year,” he says. Out of his 240 students per year, maybe 20 or so take an interest in family medicine. “The rest are aiming to become specialists,” he says. Increasing Medicare reimbursement and providing debt relief will help, he says, but the system must change much more to see a big shift in interest.